This tutorial will take you through the sequence of events in the formation and dissolution of a clot. You can navigate through this tutorial using the buttons at the top of the screen. The tutorial will ask you questions. Click on your chosen answer to see feedback; click the answer again to make the feedback disappear. When you're finished with one page, click the navigation button for the next page to move ahead. Have fun! Click on button '1' to see the first page of the tutorial. When a blood vessel breaks, the blood inside immediately seals the break with a clot. But when there is no injury, the blood stays fluid and flows through the vessels without blocking them. What tells it when to clot? How does it avoid clotting at the wrong time, while still staying ready to clot at any moment when an injury occurs? Obviously, the blood must always contain the factors needed to form a clot. You don't have time to waste waiting for your body to make them, while you lie there bleeding! If you look at a clot, you find that it contains platelets and blood cells, trapped in a network of fibrin filaments. How did these appear out of the blood, just where they were needed? Platelets or Thrombocytes are not really cells. They're fragments of large cells called megakaryocytes, which are made in the bone marrow along with other blood cells. They come from the Myeloid Stem Cells, the same cells that give rise to red blood cells and leukocytes. Like red blood cell production, platelet production is stimulated by a hormone. The hormone is called thrombopoietin (TPO), and it is made by the liver and the kidneys and released into the blood. In the blood, it can be carried to the bone marrow -- or it can attach to the surface of platelets. 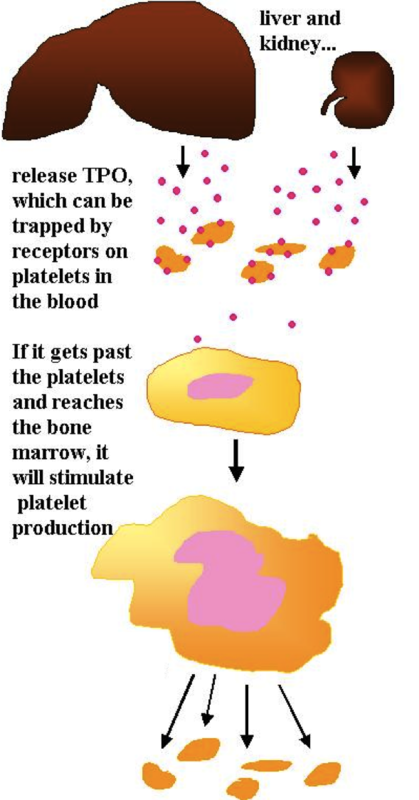 So if there are already lots of platelets, they will 'trap' the thrombopoietin and it will not reach the bone marrow. 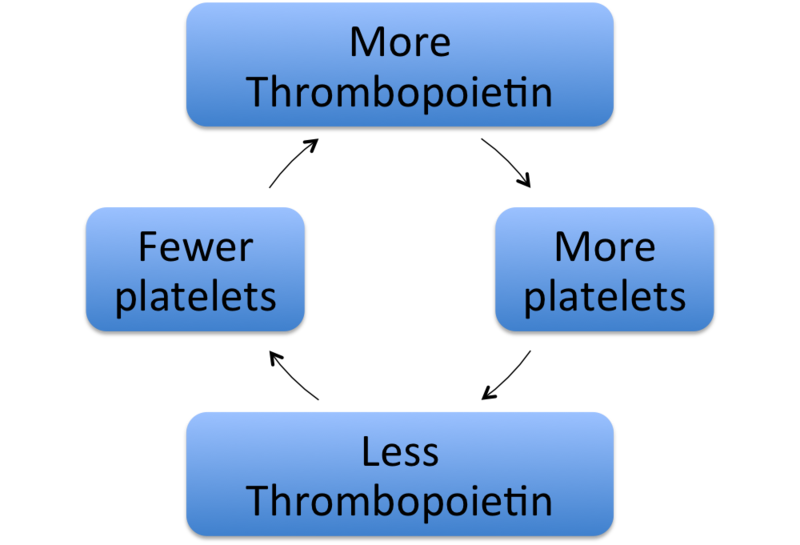 If there are few platelets, however, the thrombopoietin will not be trapped; it will reach the bone marrow and cause the production of more platelets1. Time to solve a problem! A man had problems with bruising and bleeding, and when he was tested his platelet counts were found to be very low. His thrombopoietin levels, however, were slightly higher than normal. Why were his thrombopoietin levels elevated? After the man has a platelet transfusion, what do you expect will happen to his thrombopoietin levels? No change, because he wasn't given anything that would affect his liver or kidneys. Takehome message: thrombopoietin and platelets control one another's levels in a negative feedback relationship. None of this has told us how the body forms a clot, though, or where those fibrin filaments that bind the platelets together come from. Fibrin comes from an inactive precursor protein called fibrinogen (fibrin maker). Fibrinogen is dissolved in the blood. As you go on in physiology you will see a lot of this; your blood is full of inactive proteins, ready to be turned on at any time they are needed. 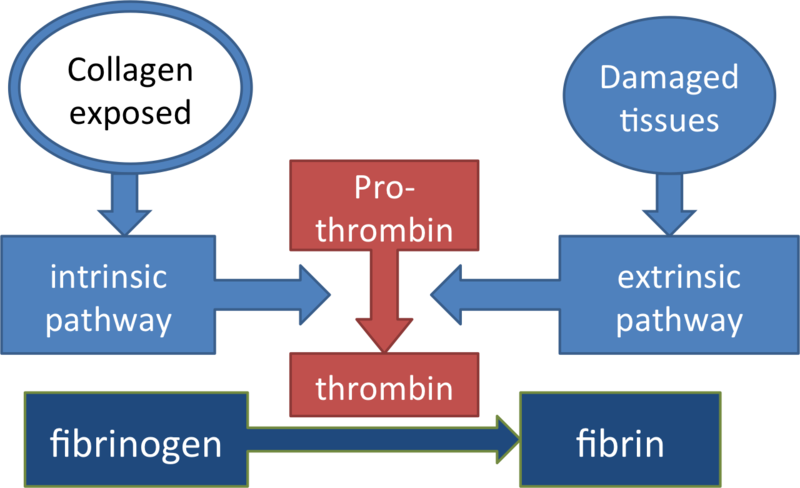 The fibrin filaments needed to form a clot are made when fibrinogen is turned into fibrin molecules, which can link together into long strands. The 'trick' of clotting is to make sure this only happens when there is an injury, and that it only happens at the site of the injury! So what is it about an injury that will activate the process? Let's follow through from the beginning of an injury, and see. You may remember from the inflammation unit that damaged cells produce a lot of compounds that affect the blood vessels. One of those compounds is Thromboxane A2, which makes the lining of the blood vessels produce adhesive proteins that can trap passing platelets. Also, when the vessel is damaged a break forms in its endothelial lining and exposes the collagen layer below it. When that happens, the platelets in the blood brush up against the injured vessel wall and stick to the exposed collagen. They do this by attaching to one side of a protein in the blood called von Willebrand factor. The other side of this protein binds to collagen. So there are a lot of things making platelets stop in the injured area. Here's an injury with the von Willebrand factor attaching to the collagen on exposed subendothelial cells, and the platelets attaching to the von Willebrand factor. It acts as a link connecting the platelets to the injury. What would happen to somebody who did not have von Willebrand factor? When the platelets adhere to the injury, they change shape and become spiky. 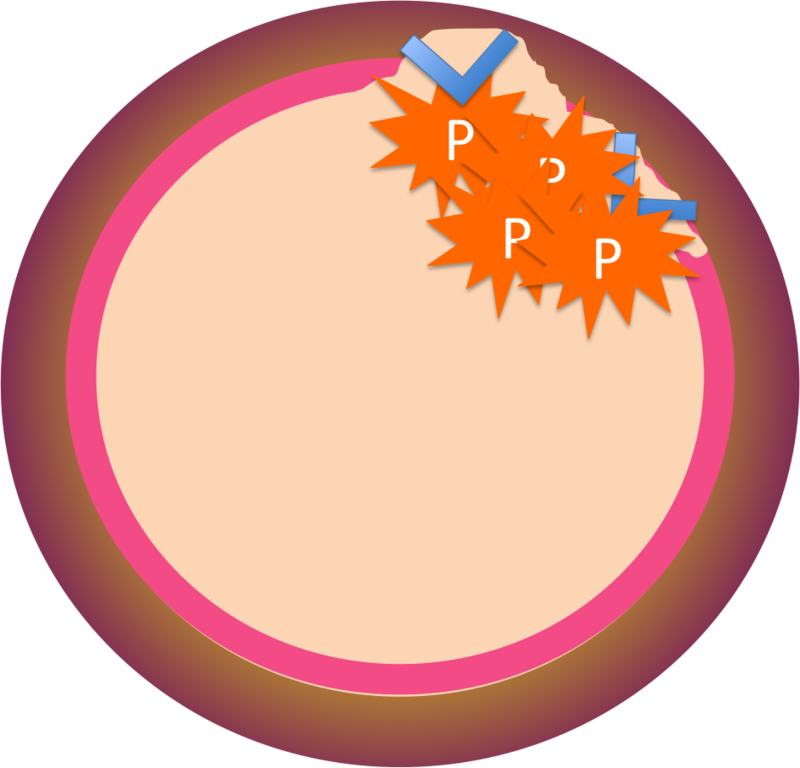 Glycoprotein receptors on their surfaces bind to other platelets until a mass of platelets, or a platelet plug, has formed. Often this is enough to seal the injury. If the injury is too large, though, fibrin filaments will be needed. Remember, the precursor protein fibrinogen was circulating in the blood all along. It needs to be turned into fibrin. An enzyme, thrombin, can do that. But because you don't want clots to form any old time, the thrombin in your blood is also an inactive form - prothrombin -which must be activated before it can make a clot form. If thrombin activated at the wrong time, a clot could form and lead to a heart attack or stroke, killing the person. This is probably why thrombin activation is a very complicated process, requiring a lot of proteins to interact. The more complex it is, the less likely that a clot will form by accident! The compounds that activate thrombin are called clotting factors or procoagulation factors (like 'Factor VIII'). Most of them are made in the liver, and require Vitamin K for their synthesis. A series of reactions like this is called a CASCADE. 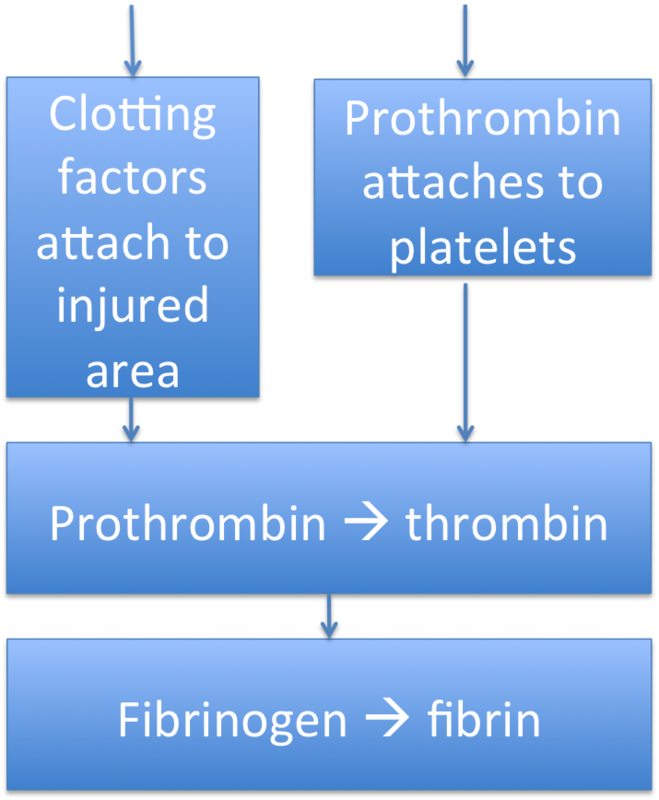 In a CASCADE, several steps are necessary to accomplish the final goal - in this case, clot formation. 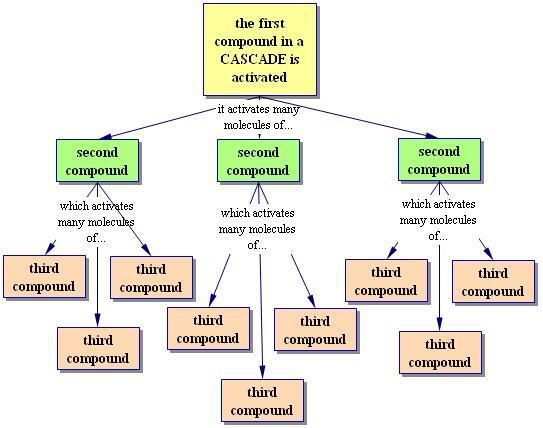 A cascade has two purposes. First, it's hard for a cascade to run by accident, because there are so many steps that have to be just right for it to work. This is important, because it would be very bad for you if you made too many clots. Second, once a cascade does start to run it can accelerate very fast. This is because each molecule activated in one step can activate many molecules in the next step. This means that if the cascade runs, the clot will form quickly - before you lose too much blood. There are two major cascades that can activate thrombin. The intrinsic pathway, like platelet adherence, is started when the endothelium is damaged and collagen in the blood vessels is exposed. You can remember this by thinking that it begins in the vessel. The extrinsic pathway involves a different set of clotting factors which are activated by chemicals released from damaged cells and vessels, most importantly tissue factor. These chemicals can be formed both inside and outside the blood vessel. 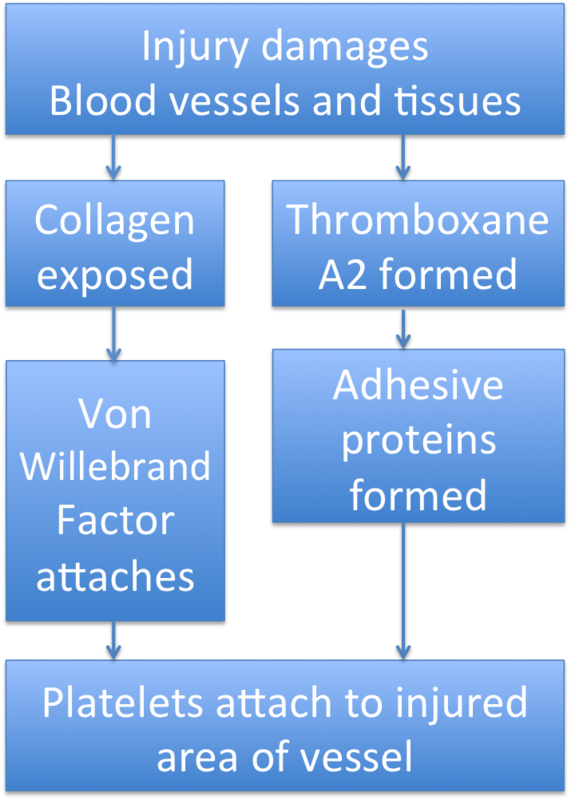 The clotting factors begin to adhere to the exposed tissue, the same way von Willebrand factor did; as they adhere, they activate one another until a complex of activated proteins is formed, all stuck to the injury. So how do all these clotting factors activate thrombin and form a clot? And how do they make sure that the clot forms in just the right place? Here's where platelets come in. While all these clotting factors are being activated by the intrinsic and extrinsic pathways, they won't have any effect on clotting unless they actually turn prothrombin into thrombin. And the prothrombin has been coming out of the blood and settling - on the platelets. So the only place this clot can actually form is where the platelets are sitting. Once thrombin has been created and has begun making fibrin, how can your body keep it under control? What keeps the clot from getting so big that it blocks the blood vessel? Your body has a way to contain this; anticoagulation factors in the blood, compounds which interfere with thrombin activity. One of them is antithrombin. What complication might be most likely in a person with too little antithrombin? Now you have a clot, so what? The clot blocks bleeding and holds the sides of the wound together. 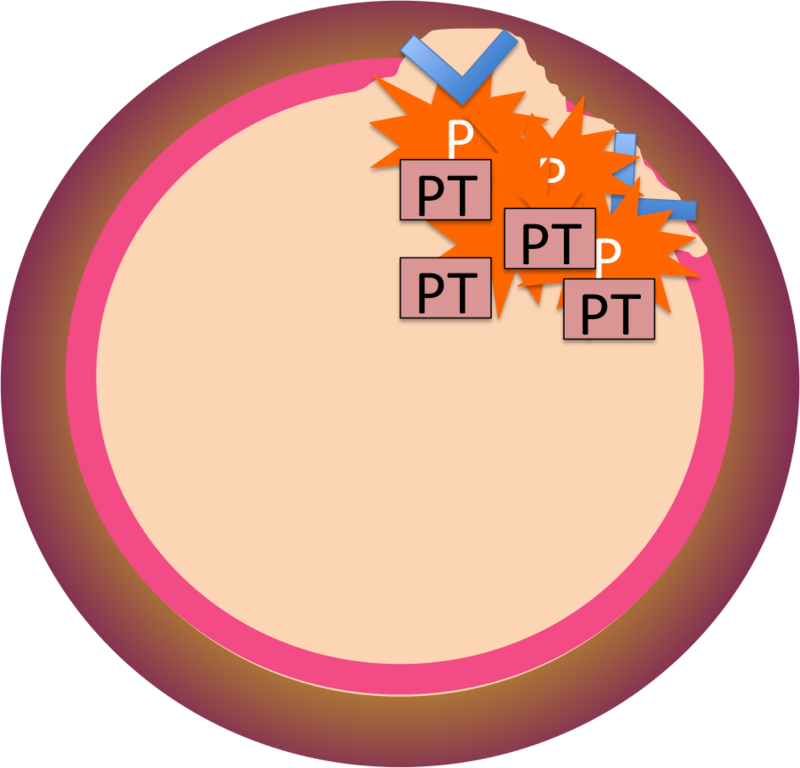 The platelets in the clot secrete growth factors, causing the tissue cells to divide and migrate into the wound. Soon, the wound is filled with new tissue. Now it's time to get rid of the clot by breaking down the fibrin. 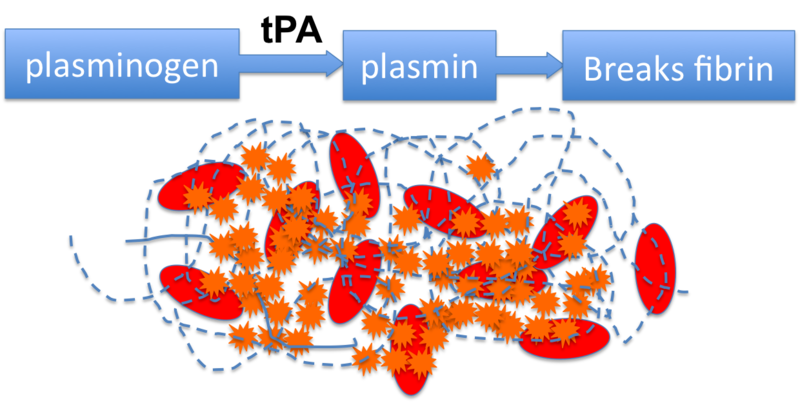 The protein that does this is called plasmin, and it also is circulating in the blood in an inactive form, plasminogen. When it's activated, it will destroy the fibrin and the clot will dissolve. 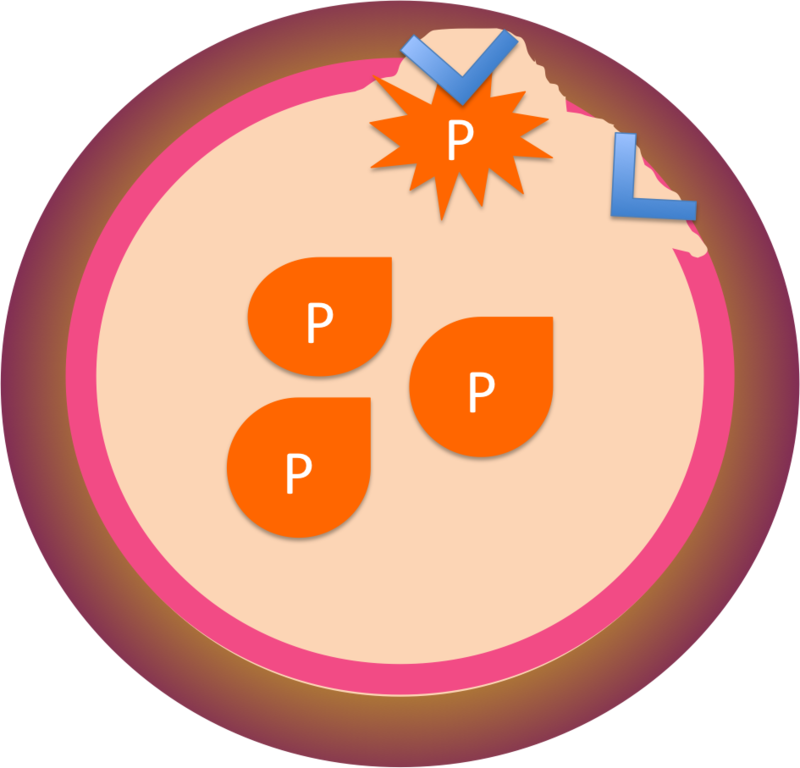 The plasminogen is activated by tissue plasminogen activator (tPA) made in the liver, kidneys, and the lining of the blood vessels. A man had a stroke, and the doctor gave him tissue plasminogen activator immediately. Why? The man's wife has been reading about clotting, and she says there are loads of anti-clotting medications out there, so why didn't the doctor give him one of those? Let's look at them, in light of our clotting flow chart. You should be able to spot just what step each of these drugs interferes with! Aspirin decreases the production of thromboxane A2. Heparin and Hirudin interfere with the production of thrombin. Warfarin interferes with Vitamin K metabolism - remember, Vit K was needed for the liver to make many of the clotting factors. The doctor says none of these drugs would had helped her husband. But why not? Congratulations on finishing the review of hemostasis! Now you should be able to explain the pathophysiology of the different clotting disorders in your own words. Happy studying!